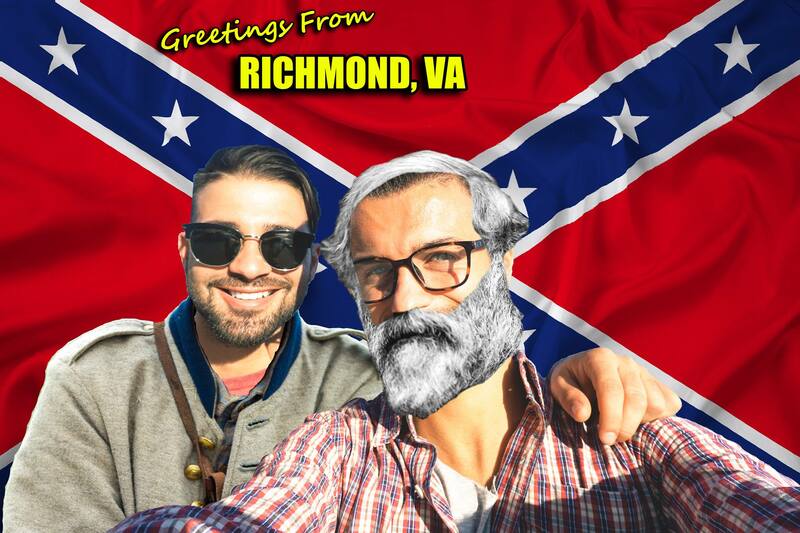 RICHMOND, Va. — The League of the South, a neo-Confederate group, has commissioned a series of Snapchat filters in an attempt to connect with potential Millennial and Generation Z converts. These location-specific imaging filters, or “geofilters,” can be used at well-known Confederate landmarks throughout the South. One of the most popular filters can be found at Richmond’s own Robert E. Lee statue on Monument Avenue. Here visitors can be turned into General Lee and placed in front of a Confederate flag background. In addition to the full beard and dandy comb-over, the filter also provides a voice-changer, altering the user’s voice to a deep southern drawl with just a tinge of genteel racism. Snapchat produces imaging filters that can accommodate more than one individual, often applying a different effect to the less prominent face in the photo. In the case of the Robert E. Lee filter, the secondary subject dons a virtual Confederate infantry uniform, complete with a layer of lice bites and dysentery-induced sweating. Adolf McCreary, a member of the League of the South, traveled all the way from Winchester to take a picture in front of the infamous statue. In an attempt to draw attention away from the League of the South’s social media ploy, the City of Richmond has decided to release its own youth-appealing Snapchat filters. A few blocks down from the Lee statue at the intersection of Monument Avenue and Roseneath Road, Snapchat users can superimpose their face on the animated, tennis racket-swinging body of Arthur Ashe surrounded by a crowd of cowering Bitmoji children.